Students were encouraged to apply for the program, and staff and faculty were encouraged to nominate specific students who have shown leadership potential in their short careers at Hofstra. Over 60 nominations were submitted by various administrators and faculty around campus. Each nominee received an email encouraging them to apply for the Blue Leadership Program if interested and available. In total, 37 applications were submitted. The program launches in February 2012, and is a part of a two tier leadership series that aims to meet students where they are and develop them at various levels of engagement. The Blue Program targets 1st and 2nd year students and runs for a semester, while the Gold Program targets upperclassmen and launches in September 2012 running for a full year. The Gold (experiencing leadership) cohort is intended to be more intimate than the Blue (emerging leadership) cohort and part of the Gold participants’ experience will be a mentorship component by which they will be mentored by professional staff and then in turn will mentor the next year Blue participants. Both cohorts will graduate from the program together in May each Spring. The Blue and Gold Leadership Series is one of many leadership development opportunities offered by The Office of Student Leadership and Activities. For students looking for a different experience or balancing various obligations spreading them too thin to commit to Blue and/or Gold, other engagement opportunities are available including the PRIDE a-la-carte workshops offered sporadically throughout the year at differing times to provide more variety for students, the Leadership Conference (Fall semester) and Leadership Retreat (Spring semester), and involvement in the various organization and team affiliations such as Orientation, Discovery Program, Student Government, Fraternity and Sorority Life, Community Service trips, and more! For more information on any of these opportunities, please contact the Office of Student Leadership and Activities at osla@hofstra.edu. Good luck on finals and enjoy the Holiday Season! Better Thank Your Mama for that Education She Gave Ya! It's Wednesday and I hope you all get that Salt-n-Pepa reference. If not, I'm sorry: it's been a long week for everyone: I saw you all over the unispan in your Hofstra sweats, UGGs, and huge backpacks. How are finals going? Are you rocking them? I know you are because that's what Hofstra students do! For you graduating seniors, this week is going to feel like a dream between finals, the holidays, finishing college... YES, THESE ARE YOUR LAST DAYS OF COLLEGE. C to the RAZY! Aight, so here's the deal, as you’re taught to acknowledge your breath in Yoga (I just came out of a practice-yoga-at-your desk class, it was crazy chillaxin’, brah), I’d like you to acknowledge those whom gave you breath during your college years. This is to say, please let those who supported you throughout your time at Hofstra whether emotional, financial, or both know how much you appreciate that they’re in your life. Remember those care packages with the dozen cup o’ noodles that your main man, Dad sent you? Your blood pressure and sodium levels sure do. How about that sick paper you wrote on Napoleon’s conquests that your professor laboriously edited for you for a month during open office hours, remember that? ZZZzzzzzz. You don’t anymore, but your Prof. is definitely mad proud and deserves a high-five thank you. How about when your BFF4EVAZ sat with you and told you to stay at Hofstra that Saturday night when so-and-so dumped you making you so sad you wanted to leave? So-and-so? Who? Exactly! I'm so glad you stopped being so EMO about all that finally. What about when you academic dean told you what was up with your poetry and advised you that you would make a better advertising executive one day than the next Maya Angelou? What’s up with all her poems having the word beloved in them? Hey, she knew how to thank her peeps and that’s what’s up! My point is, all these people helped you get to where you are today: graduating and you need to thank them! So, congratulations to yourself, but make sure you give a shout out to all those who love you and contributed to your successful academic career at Hofstra. Stop by the Office of Parent and Family Program’s Senior Tribute Table until 4:30 p.m. today, December 14 or tomorrow, December 15 from 12-4:30 p.m. outside the Plaza Rooms and Nancy will supply you with as many thank you cards you need. Once you write your cards, let us know if you would like us to publish your message on our website, hofstra.edu/parents, in addition to mailing them to your RL (real life) guardian college angels. If you can’t roll by our table, come by 200 Phillips Hall (it’s the building right by Hofstra Hall, that big white house) and we’ll give you all the materials you need to spread the love. Be cool: Thank those who got you through school. I'm so proud of you it makes me want to cry. Congrats!! Sleep- it feels hard to come by during finals, but it can make or break your exam performance. Did you know that pulling an all-nighter will result in the same reflexes as being legally intoxicated? Does that sound like a good idea when walking into your calculus exam? Sleep is essential for memory development, so one more hour of sleep will actually do you more good than one more hour of studying the night before an exam. Given that, how much sleep are you getting these days? Good luck on your finals. Safe travels over the holidays. And I'll see you back here with more polls in January! Happy Holidays from the Office of Student Leadership and Activities (OSLA)! While it is a Hofstra tradition that the Hofstra community serves our local communities all through-out the year, I encourage you to take a moment during this Holiday Season to reflect on all the ways that you have served this past year and how you would like to continue serving in 2012. 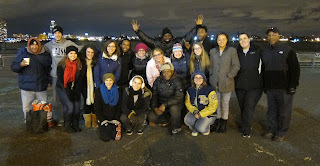 OSLA rang out the 2011 year serving with the Midnight Run student committee by giving out clothing, food, and toiletries directly to the homeless on the streets of New York City. This bi-annual tradition was started last spring semester after OSLA's first Midnight Run was such a great success! The Midnight Run is a non-profit organization that was started by a man who was homeless as a way for those who have to help those who have-not. There are now over 1000 runs every year with many different organizations volunteering to give out donations on a nightly basis. It is also a great way for volunteers to realize that the negative stereotypes about the homeless are not true and that the homeless are real people no different than themselves. None of us are safe from homelessness. It only takes one tragedy (whether it be a natural disaster, an accident, or a medical issue) to potentially result in homelessness. 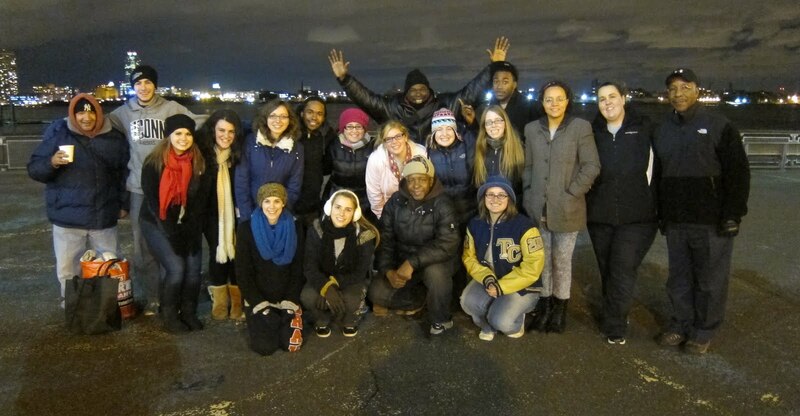 Above is this fall semester's Midnight Run Committee. On the evening of the run, November 30th, we were worried we would run into a lot of traffic because not only were President Obama and Mrs. Obama in the city, but so was Justin Bieber for the tree lighting ceremony! Luckily we ran into no problems, and driving was smooth sailing. I think in part because the Midnight Run organization was kind enough to give us all our stops downtown. So all November the Midnight Run student committee collected clothing, food, and toiletries that they sorted out the evening before the run to hand out to the NYC homeless. We saw around 60 men and women and handed out over 100 sandwiches, snacks, hundreds of pieces of clothing, shoes, jackets, etc. It was a great night, and luckily not too cold as well! The Midnight Run is truly a life-changing experience. Thank you to the co-sponsors of this event: Public Safety, Lackmann, and Recreation and Intramural Sports! Thank you also to everyone in the Hofstra community who donated clothing, food, and/or toiletries! Thank you, thank you, thank you! I can tell you it was much appreciated by those whom received your donations. We will be collecting items again in April, so keep an eye out for that! Any students interested in joining the Midnight Run student committee in the spring 2012, please stop by OSLA (260 Student Center). It's that time of the semester again where the Office of Residential Programs likes to recognize a few of our outstanding staff members. Here are the winners for the month of November. Resident Assistan t of the Month: Chelsea Tirrell Chelsea is an RA in the Netherlands complex. She works in Orange House which is the Leadership living/learning community. Chelsea has an amazing disposition and fits the role of a Resident Assistant well. She is outgoing, personable, approachable and highly motivated. She has really helped boost the morale and efficiency of her co-RAs by supporting them in all areas of the job. Chelsea has amazing relationships with her residents. She is very well versed in their interests, issues and concerns. She is supportive of their efforts/interests within the Leadership house, motivates them to get involved in on campus organizations and really helps them make the most of their experience outside of the house. She has motivated (along with her fellow co RA Steve) a large group of the house residents to work towards their goal of creating an anti-bullying club here at Hofstra, which was recently recognized as an official club by OSLA. She has helped to develop this great community! Wonderful job Chelsea! Senio r Resident Assistant of the Month: Rachel Lutz Rachel is the newly-appointed SRA of Colonial Square East. She has only been in this role for about two months and she has already proven herself to be a strong leader in her building and for her staff. Rachel jumped right into her responsibility of being adviser to the Colonial Square Hall Council. She works hard to make sure that the Hall Council will be successful and takes ownership to insure that success. Rachel's ability to always think ahead and anticipate possible issues enables her to be a strong asset to her supervisors and co-workers. Thanks for being a super star, Rachel! Program of the Month: Billy Finnegan and Alex Romano Billy and Alex did a wonderful job in creating a Thanksgiving program for Stuyvesant Hall, where about 40 students attended. The program was really about giving thanks and not just eating food. At the program, Billy and Alex told the residents about the 1,000 Thanks (& Giving) Project (that is sponsored by Hofstra Hillel each Holiday season) and said that before getting a plate of food they needed to send one person a special note of thanks. All were pleasantly surprised when many of the residents loved idea and filled out 2 or 3 cards. Once everyone had gotten their food, the students went around and talked about something that were thankful for. This spurred a lot of conversation and many people became emotional and realized just how much they have to be thankful for. Thanks you to Alex and Billy for organizing such a successful program! Check back next semester to see our new winners! !